I needed something to jumpstart my creativity for 2015 so when I saw that Heather Powers was holding another Muffin Tin Challenge, I jumped on board. 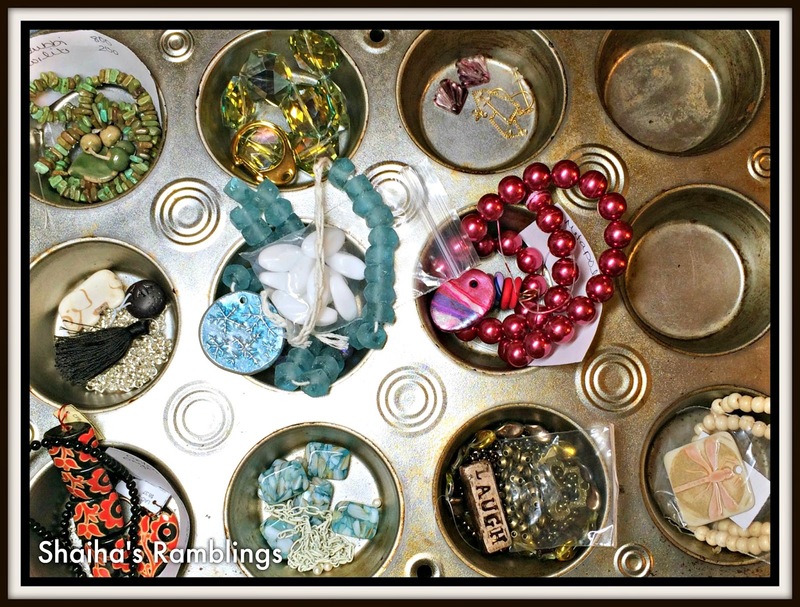 My job, since I choose to accept it, was to put together some bit and pieces such as focals and supporting beads, clasps and whatnots in a muffin tin. Once that was done, all I needed to do was put the designs together. The picture above is what I started out what. I ended up filling up the other three spots also as I went along. I only ended up making eight different pieces in the time allowed (only able to show off six as the other are for upcoming challenges) but I discovered that I really love this system. As I would empty out a spot, I would end up refilling it with another idea. Now to show you what I came up with. This first necklace is based around a ceramic focal from Blu Mudd. 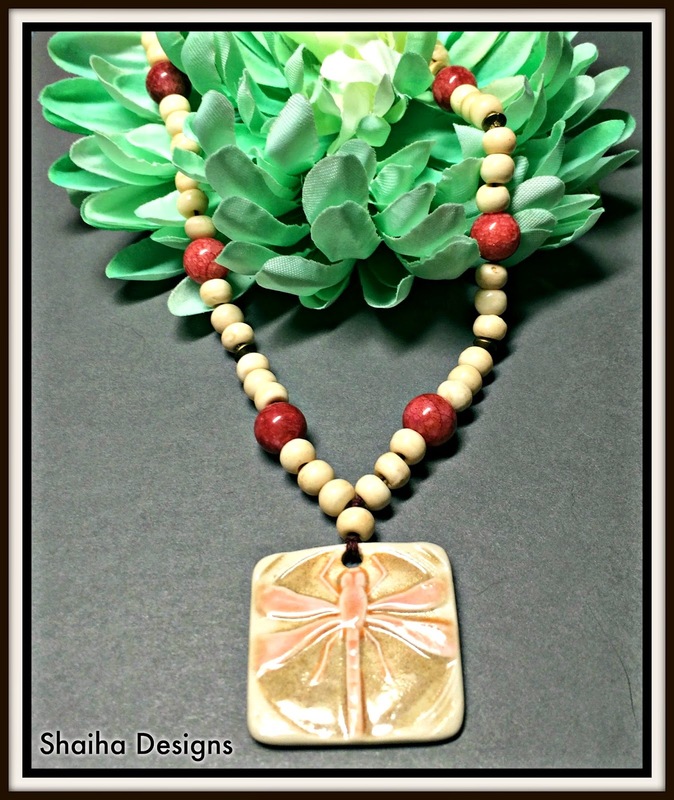 I just loved this delicate dragonfly and wanted to play up the soft colors with agate and bone beads. They are all handknotted on waxed linen. 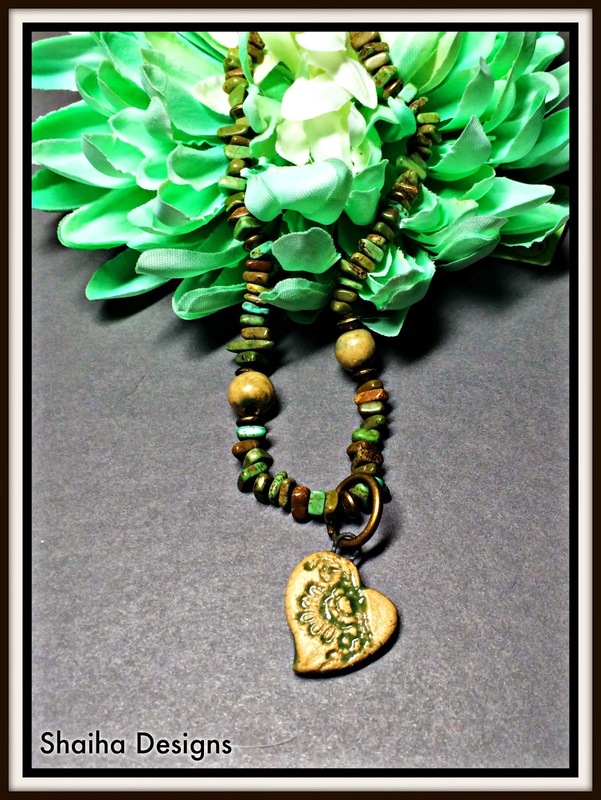 Next up is a rustic necklace featuring a ceramic heart focal from Grubbi along with a couple supporting ceramic beads and magnesite chips. This was probably the most difficult to get to cooperate because the holes in the magnesite are so tiny. I wanted to go simple with this necklace with one that you could just toss over your head and go. 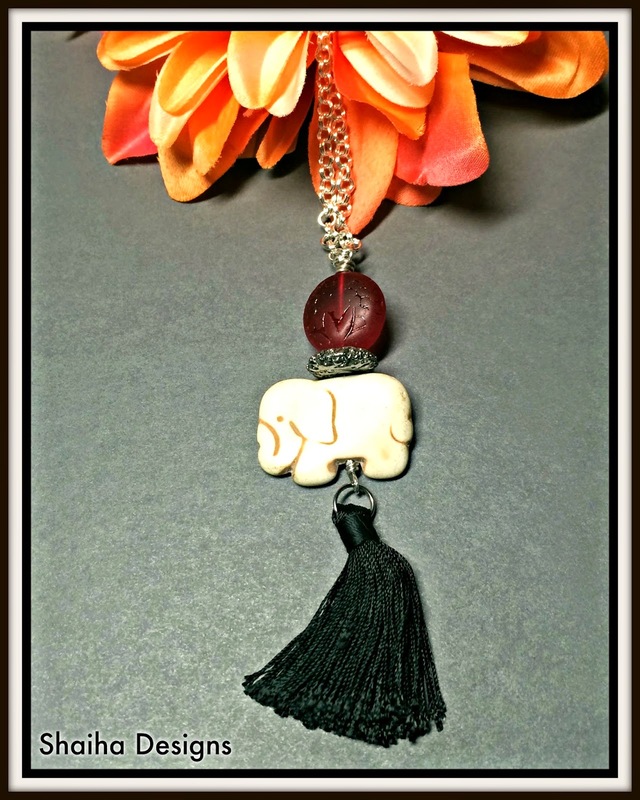 Both the elephant and the red bead are vintage lucite. Very lightweight. 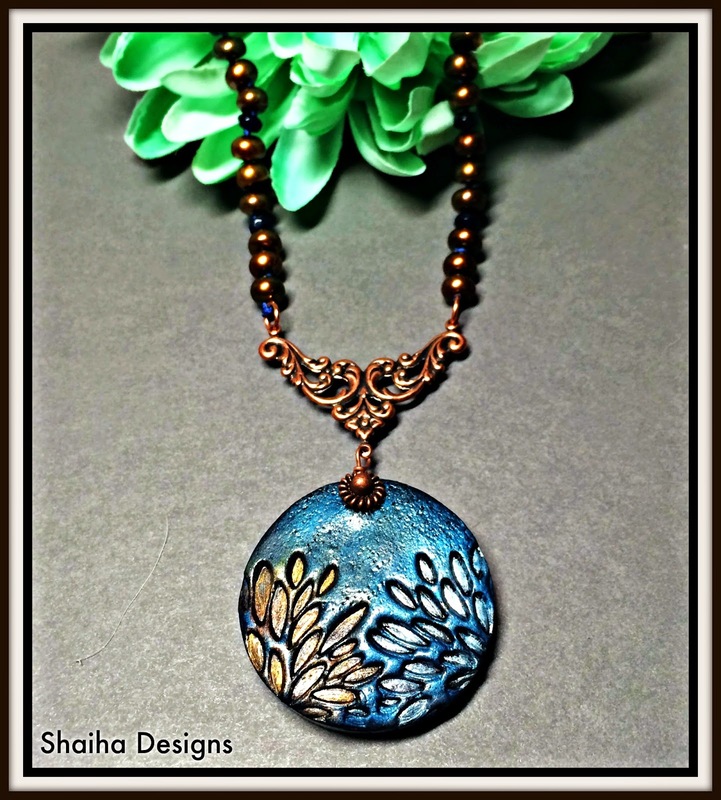 This next necklace is one that I have had in the back of my mind ever since I picked up this gorgeous focal from BeadLovelies. The focal has a copper tint to it that I really wanted to play up so I combined some copper findings and some copper colored fresh water pearls. To play homage to the beautiful blue, I also included some dyed jade roundelles and knotted it all together. Now I have shown off all the necklaces, next up is the lone bracelet. I used a bracelet bar from the Jangles line along with some brass beads, some peanut seed beads and a brass clasp. I am rather pleased with just how this turned out. And finally a pair of earrings. Both the leaves and the yellow beads are from Metapolies. I don't tend to work a lot with yellow but the beads and the leaves were packed together and demanded they stay that way. I really had a lot of fun with this challenge and loved how I learned a new technique to corral my creativity. For more information about this technique and to see what other designers came up with, be sure to click here. It's so much fun going through and looking at what people made... but I'm also having a fun time trying to suss out what's in the cups that didn't get finished or shared. I want to see more of those red & black Golem beads and the icy looking beads with the snowflake pendant. :) Great work coming up with some fun designs! Beautiful piece. My favorite is the colorful earrings.Nice job! Beautiful Shaiha! 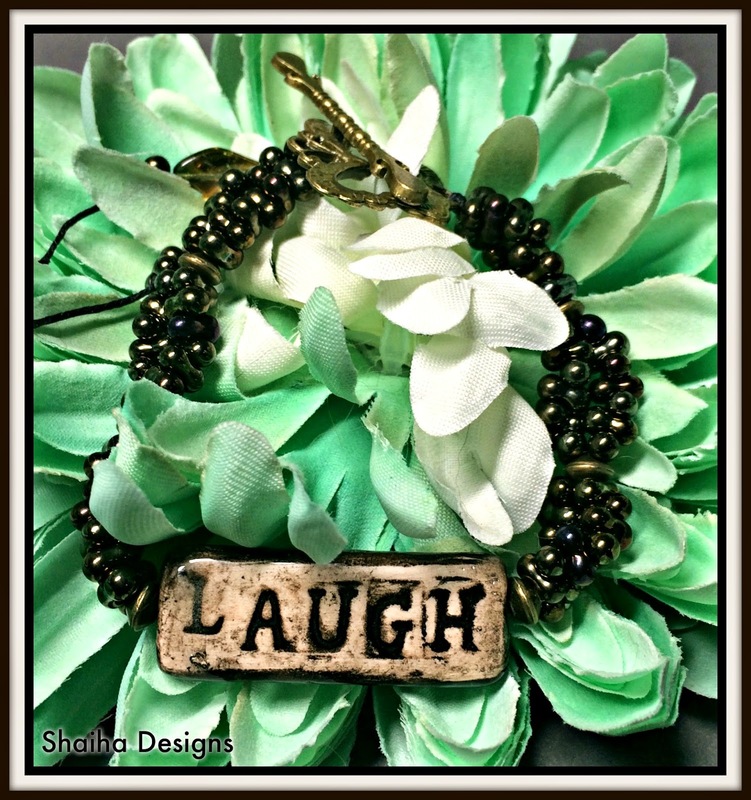 Really drawn to the laugh bracelet! All of them turned out great! I love all your designs, but the bracelet is a knock out! Love love love it! Everything is so pretty, I can't decide what I like best though I keep going back to that bright pair of earrings. Gorgeous pieces. Great work. I love the earrings! 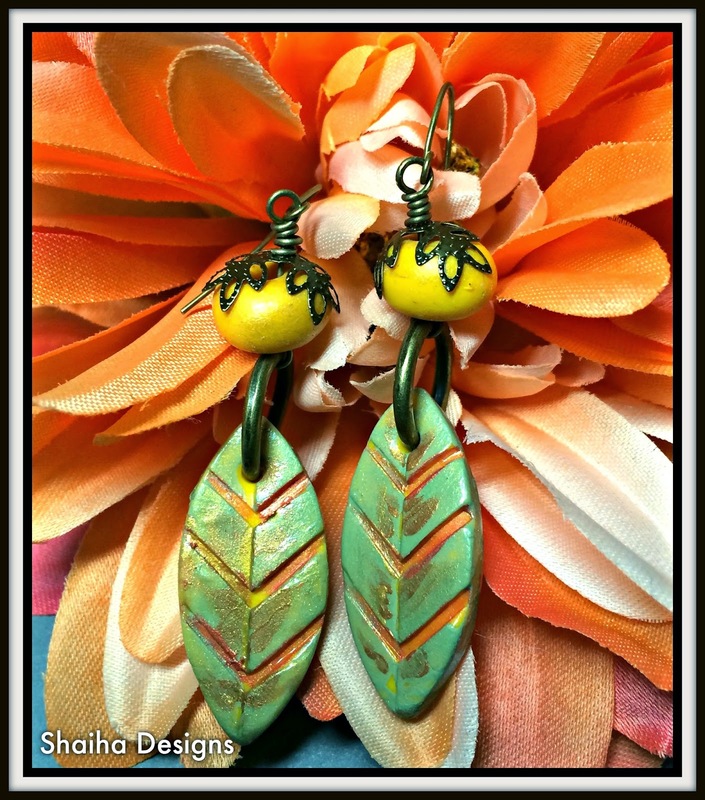 Beautiful designs, I love the colourful leaf earrings! Wow, you took the challenge and STRETCHED. If I had to pick, it would be the elephant. Simple. elegant, organic. All beautiful pieces, but I really love the colors of the heart necklace and the bracelet is just great! These are all gorgeous but the dragonfly captured my heart. Thanks for sharing the inspiring beauty. As always, your pieces are beautiful. I always enjoy seeing the fruit of your labor. I really like the dragon fly necklace and the 'Laugh" bracelet...gorgeous. What a great way to get some inspiration. Thank you for sharing. :) Love the earrings and the elephant. So Beautiful, recently prepared a girlfriend birthday, she liked jewelry, so I intend to send her Colliers Swarovski to give her a surprise.